Graduated to the University of the Studies of Milan in Political Sciences, with full marks, with the thesis titled “The sociological aspects of the sport in Italy”. He has a long-term academic and managerial experience in the sport field. He is Teacher, at the Italian and foreign Universities, in organization and sport management and its Bodies. Speaker to National and International Conferences. He is author of specialized issues and technical-scientific articles in the aforesaid field. He’s sport Sociologist. He’s author of specialized issues and editorial of technical – scientific in that field. Expert of management, communication, legislation and sport marketing, has covered and still covers, important assignments to national and international managing level. he has cured the devising and the realization of important national and international events For Public agencies, Sport Organizations and Private companies let alone the coordination and the Didactics of formative activities for sports managers. He is Manager of University Master in “Sport Management, Marketing & Sociology” to the University of Milano-Bicocca since 2002. President of the Fédération Internationale Cinema Television Sportifs – FICTS (Federation recognized by the IOC – International Olympic Committee associated with 113 Countries, with seat in Milano (Italy), since 1996. V. President of the FISpT (Fédération Internationale du Sport pour Tous), (World-wide sports Organization for the social sport associated with 74 Countries, with seat in Bruxelles) from 2008. He has been person in charge for “Commissione Comunicazione e Formazione quadri” from 1998 to 2008. V. President of the UESpT (Union Europeen du Sport pour Tous), from 2004 to 2008. Member of the SIMS (Italian Society of Sport Management) and of the EASM European Association of Sport Management, from 1999. Teacher at the Académie Internationale Olympique of the IOC (International Olympic Committee) for the Management and the Organization of the sports organisms (Annual Course for representative of 85 Countries), from 1997. 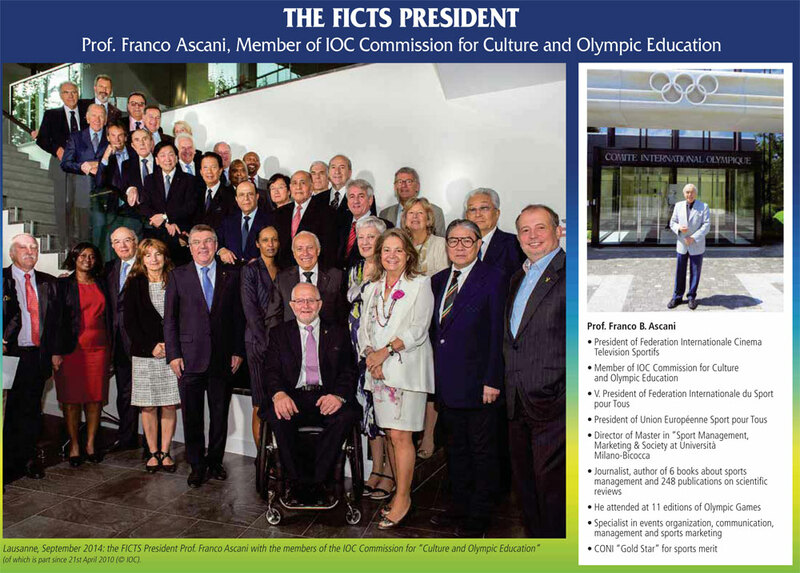 President of FICTS Italy a. s. d. (Italian Section of the Federation Internationale Cinema Television Sportifs), since 2004. President of Assomastersport (National Association for the research, the development, the professional specialization and the sports events organization), since 2004. Coordinator of the Committee of Coordination and Headmaster to the University Master in “Sport Management, Marketing and Sociology” to Department of Sociology and Social Research of the University of the Studies of Milano-Bicocca for Academic Year since 2005. President of the Commission “Examinations – Project Work discussion”. Scientific Coordinator of the Specialized Master “Sport Business Management” of the Business School of “Sole24Ore” 2009/2010. Teacher of Organization and Management of the Sport to the “University Master of II level “Sport and Management” of the “Cattolica University” of Milan from 2004. Teacher of Branches of Law and Sport (Private Law in sports field – Administrative Law) to the Faculty of Motor Science of the University of Pavia since 2008. Teacher for the Courses of Formation of high level of the NOC and the National Federations Sport (Swim, Canoe, Volley, Athletics, etc) from 1994. Teacher of “Sports Organization and Communication” to IULM of Rome for the “Specialist Degree Course in Management of Sport and motors activities” (2007/2007). Didactic responsible, Member of the Organizing Committee and Teacher to the “University Master of “Management of the Sport” to the Faculty of Motor Sciences of the Statale University of Milan, for the Academics Years 2002/2003, 2003/2004, 2004/2005. Teacher of “Legislation, Regulation and Organization of the sport” to the Faculty of Motor Sciences of the Statale University from 2001 to 2005 and to the Lombardy ISEF – Higher Institute of Physical Education of the Lombardy. President of Commission Examination – Signature and Argument Thesis (1987-2001). Teacher of “Marketing of the Sport” (chair), Management and Organization of the events (laboratory) to the School of Specialization for European Manager in economy and right of the sport of the University of Teramo (Italy)- Exams and Project Work (2001 – 2002). Teacher of “Management of the sport” to the Master in management of the sport organization to the Department of Economy and Technology of the San Marino University and Project Work (1997 – 2000). Teacher of “Sport Legislation” in the communitarian ambit for the circulation of the persons and the sportsman to the Course of improvement in Management of the Sport to the European Association of Management sport of the ISEF of Firenze (Italy). Erasmus program of the European Network of Sport Sciences in Higher Education – Examinations and Thesis (1996 – 2001). Advisor for the sport of the Minister of the Sport Tourism and Show (1992 – 1993). Regional V. President of NOC Lombardia (1972 – 1976). Provincial V. President of NOC Milano (1980 – 1984). Didactic – Scientific Coordinator of the Regional School of the Sport of NOC from 2009 to 2010. Advisor for the Sport of the Regione Lombardia (1972 – 1974 and 2001 – 2005). National Advisor of the Italian Federation of Athletics (FIDAL) (1972 – 1988). Member of the Executive Committee of Agency A. FIERA MILANO (1972 -1976). General Executive manager of the Spa Freeway Milano – Serravalle – Ponte Chiasso e Tangenziali di Milano (1993 – 1997). General manager of the CMSR (Milano Centre for the Sport and the Recreation of the Common of Milan) – Agency that manage 12 Sports Centres (Lido of Milano, C.S. Saini, etc) and formative activities for 50,000 enrolled every year. V. President of UESpT (Union European du Sport pour Tous) from 2004 to 2008. He has collaborated with the Organizing Committees of Olympic Games of Monaco, Montreal, Moscow, Los Angeles, Seoul, Albertville, Barcelona, Atlanta, Sydney, Athens, Turin, Beijing. Member of Organizing Committees of great sports events, international cultural and recreational, national and local (“World-wide of Athletics – Rome ’87”, “Fifa World-Cup of Soccer-Italy ‘90”, “Plan-program of the sports systems”, “World-wide of Ice Speed”, “World-wide of baseball”, “European Cross of the Nations and Championships Indoor of athletics”, “Grandfathers & Grandsons in track” , “L’Ambrogino” , etc). He has acquired a remarkable experience from 1962, through the Organization of initiatives – only in Italy for the promotion of the “Sport for all”, starting on the sport (free of charge), through the “TROFEI DI MILANO – PIU’ SPORT CON I GIOVANI” (of which he is President of the Organizing Committee), beyond 2.900.000 students of the primary schools and from Milano averages (97,000 in 2009). President of the National Council of Associazione Italiana Cultura Sport (AICS), National Company of sports promotion recognized by the NOC and the Ministry of the Home Affairs with seat in Rome (on 2007: 730.000 Provincial and Regional Associates, 8.000 Groups, 120 Provincial and Regional Committees in Italy), from 1998 to 2006. He has cured on behalf of Public agencies, the planning, the realization and the direction of cultural international events which: “SPORT CINEMA SHOW ’96” with the E.A. Milano Fiera; “FILM SPORT SHOW ‘97” with the E.A. Fiera of Genoa; and the editions ’98/Verona and from 1999 to 2006, to Milano of “SPORT MOVIES TV – MILANO INTERNATIONAL FICTS FEST” which Director. He has cured the planning let alone the aspects of the sponsorship and the realization of sports events on behalf of great Companies which, among the others: Colgate Palmolive; Plasmon; Centrale del Latte di Milano; Nestle; Mondadori; Euromarket; GEKO; Philip Morris; Diadora, AEM (Energetic Company); IGI (Institute for the Italian Ice cream); Milano Society Horses Race; SNAI Services; CO.RE.PLA; Autogrill; Ferrero; Samsung, Superga, Eberhard, Monte dei Paschi di Siena, Istituto per il Credito Sportivo, Jaeger-LeCoultre, Mondo Spa, FIAT, Lambretta. Journalist, is enrolled to Order of the Journalists of Milano from 1972. Editor of the International Press Agency “Sport Movies & Tv” from 2007. Editor of sports periodic and free time: “Presenza Nuova” (Official Organ National agency of Sport Promotion, from 1999 to 2006), “Ghiacciosport” (Official Organ of the NOC Italian Sport of Ice Federation, from 1980 to 1984), “Lo Sportivo”, “Il Giornale del Collezionista” , “Milano sette” and “Il Circolo”. Editor in different daily newspaper (“Gazzetta dello Sport”, “Il Corriere di informazione”, “Avanti”, “Gazzetta di Mantova”) and special correspondent to 10 editions of Olympic Games (Monaco, Montreal, Moscow, Los Angeles, Seoul, Barcelona, Atlanta, Sidney, Athens, Beijing). Collaborator with “Il Sole 24 Ore Sport” (editorialist), the “Gazzetta dello Sport”, “La Corsa”, “Trainer”, “Calcio Business” and with newspapers of the field: (“Record”, “Athletics”, “Jogging”, “Il Cartellone di Milano”, “Sport Azienda”, “Espansione”, “the Newspaper of the USSI”, etc) and television and wireless heads (RAI – Telelombardia – Antennatre – Telelefante – Radio Montestella etc). He has published 279 articles on daily paper, periodicals, scientific and specialized magazine of sport, management and marketing of sport. “Management e Gestione dello Sport” (Sperling & Kupfer Editori , Milano, 2004, pagg. 576). Adopted in the University Faculties of Motor Sciences and Sport for triennial Degree, specialized and Master. He has written for the “Treccani Encyclopedia” the part about “the Olympic Cinema, Tv and Games” (2004). In 1978 he has been awarded, by Sandro Pertini (former-Italian Republic President, of the title of the “Republic Knight”. In 1988 he has been awarded of the title of “Official Knight to the merit of the Italian Republic”. In 1978 “Star of bronze to the sport merit of the NOC” (Giulio Onesti President). In 1983 “Star of silver to the sport merit of the NOC”. (Franco Carraro President). In 1983 “Oak to the merit of 1st degree” of the Federatletica (Primo Nebiolo President). In 1985 “Award Emilio De Martino” – “Love for sport”. In 1985 “Award Peppino Meazza” – 7th edition. In 1987 “Oak to the merit of 2nd degree” of Federatletica (Primo Nebiolo President). In 1989 “Gold Ambrogino”, official merit of the Municipality of Milan. In 1989 “Silver Plate” IAAF for the World Marathon Cup. In 1994 “Gold Medal of merit” of the Provincial Administration of Brescia. In 1995 “Follaro d’oro internazionale” for the Cinema and the sport Television. In 1999 “ESCA Award” (European Sponsorship Consultants Association). In 2001 “IOC Award” for Voluntary service Year” (Juan A. Samaranch President). In 2003 “Merit of the Sport” – (Quarantennale – Italian Association Culture Sport). In 2006 “Atlant Award” to the Festival of the Tv and Cinema of Moscow. In 2007 “Oak to the Merit of 3rd degree” of the Federatletica (Franco Arese President). In 2008 “Civic Merit by Municipality of Milano” (as FICTS President). 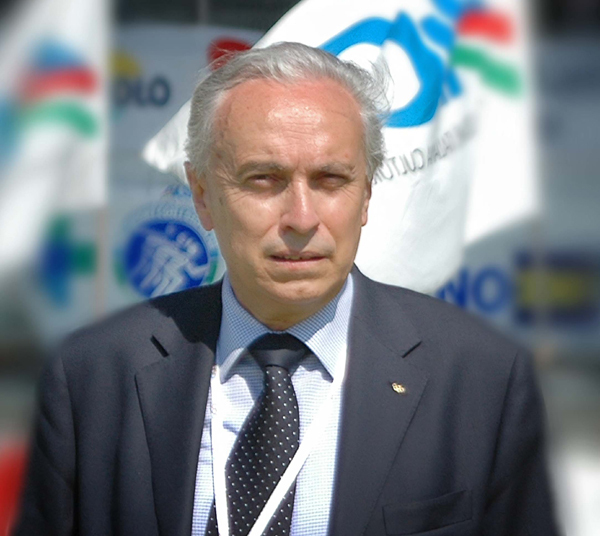 In 2010 “Star of Gold to the sport merit of the Italian NOC” (Gianni Petrucci President).